The Friday File: Michael Flynn’s career as White House national security advisor lasted a record-short 24 days. The shortest tenure in that post had previously been held by William Jackson, who served in the Eisenhower White House for 129 days, followed by Richard Allen, Reagan’s first of six such advisors, who lasted 348 days. 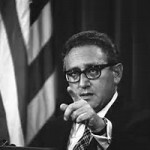 The longest serving, Henry Kissinger who served Presidents Nixon and Ford for a combined 2,478 days.